These stocks were the best performers last year. 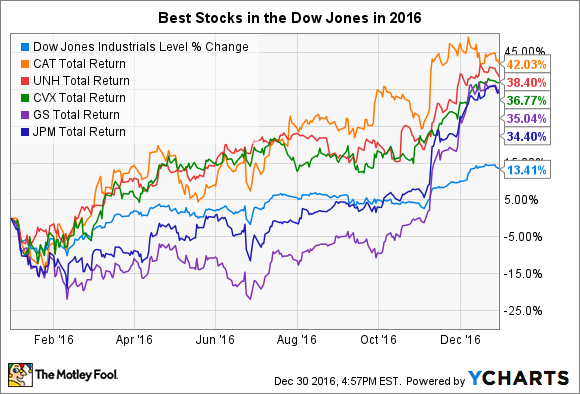 The Dow Jones Industrials (DJINDICES:^DJI) had a solid year in 2016, gaining more than 2,300 points and finishing within shouting distance of the 20,000 mark. Yet even though the average's 13% rise was impressive, the best-performing stocks in the Dow sported much stronger gains. Below, we'll take a look at Caterpillar (NYSE:CAT), UnitedHealth (NYSE:UNH), Chevron (NYSE:CVX), Goldman Sachs (NYSE:GS), and JPMorgan Chase (NYSE:JPM) to see why they were the best stocks in the Dow in 2016. The most obvious thing that most of the top stocks in the Dow in 2016 had in common was the fact that they had been among the biggest victims of negative trends in previous years. Chevron is the most obvious example, given that the energy giant had to deal with plunging crude oil and natural gas prices in 2015 that shook the entire industry and forced massive retrenchments, even for the largest players in the sector. Yet as crude prices per barrel climbed from the upper $20s early in 2016 to close the year in the low to mid-$50s, so, too, did optimism about Chevron's ability to bounce back. Similar factors were at work with Caterpillar, with the heavy-equipment maker enjoying second-order effects from the bounce in the commodities markets. In addition to its exposure to energy, Caterpillar also benefited from improving conditions in the base-metals market, with a big rise in copper prices helping to convince some investors that healthier economic conditions across the globe could finally spur the long-awaited turnaround for Caterpillar. Meanwhile, both Goldman Sachs and JPMorgan Chase saw nearly all of their gains come in the last two months of the year. Throughout most of 2016, the two Wall Street giants had dealt reasonably well with market volatility, but concerns about the prospects for higher interest rates weighed on the pure retail banking side of the business, especially for JPMorgan Chase. Yet the election of President-elect Donald Trump opened up the prospect for potential easing of regulatory restrictions on large banks, and a rise in long-term interest rates also led some investors to conclude that better conditions for core bank lending might lead to higher profits for the big financial institutions. A new era for healthcare reform? Meanwhile, UnitedHealth is the outlier among this group, having seen quite strong performance for two years in a row. For the most part, the health-insurance giant has navigated changing conditions in the industry quite well, adapting to reform efforts and finding opportunities to grow. At the beginning of the year, UnitedHealth's success was far from assured. Despite posting gains of nearly 20% in 2015, UnitedHealth investors were concerned about the company's statements about its Obamacare health-insurance exchange products, saying that it expected those policies to lose money and eat into its profits from elsewhere in its business. Yet many investors noted that one positive impact from Obamacare for UnitedHealth was the big increase in the company's provision of coverage under state Medicaid programs, which the Affordable Care Act expanded -- these have been extremely profitable for UnitedHealth. Moreover, UnitedHealth has also gotten a post-election bump, as investors weigh the odds of a complete repeal, or dramatic revamping, of the current Obamacare system. Campaign promises by the President-elect suggested that he would demand full repeal of the program. But some backpedaling since the election has brought that into doubt, and it's likely that the final fate of the healthcare program won't be clear until well into 2017. What's ahead for the Dow in 2017? Many of the factors that propelled these five stocks higher show few signs of stopping. Oil and natural gas finished 2016 near their highest levels of the year, and some see further gains as likely, benefiting Chevron directly. If interest rates keep rising, then banks like Goldman Sachs and JPMorgan Chase should keep benefiting from the move. That doesn't mean that the entire Dow would rise in response, but the influence that these stocks have on the overall average is substantial. With another bull market year under their belts, Dow Jones investors have a lot to celebrate about 2016. Thanks to these five stocks, double-digit returns helped boost gains for those who invested in the Dow over the past year.